Congratulations to Robin at Bittersweet Punkin (comment number 15) for winning today's drawing for the "In the Garden" dimensional notecard set! And never fear... if you didn't win today's drawing there's one a week from today! For next week's "Giveaway Saturday" drawing, I'm giving away a piece of my original Vintage Recipe Shadowbox Art. Framed in a shadowbox, this piece of hand-cut dimensional paper art is designed and hand-constructed by me. 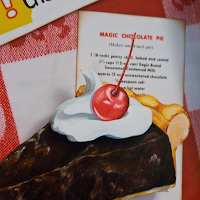 Featuring a real vintage recipe for "Magic Chocolate Pie" and a high-quality reproduction of original watercolor illustrations, this piece is hand-cut and hand-constructed in layers on a photographic reproduction of a vintage red and white checked tablecloth. The finished white wooden frame measures 9 1/2" x 9 1/2" square. I have signed the piece and also included the full recipe on the back of the piece (just in case you ever want to make it!). This is so unique and I love these. Thanks for the opportunity to win one. Too bad the real live version doesn't come with the picture!! This would be such a fun kitchen pic! Um, I need this. For my kitchen. Truly, I do. This is truly amazing. It is cute, and perfect for a kitchen or even an office. How unique! Please count me in!! This would cute in our kitchen, enter me please! You are so multi-talented and it would go perfectly in our kitchen. I recently painted a wall tomato red in our kitchen. So, yes please include me in your drawing? Have a great week! Education week was awesome! This is so sweet of you! That is just adorable too! I have gotten so far behind on my blog reading! I just have to say I love your designs! Is the creative muse going to give you Lucy Maude kitten designs? That is a really neat and unique art that you have there. Sign me up for the contest! I love that piece of art! It's so pretty and would look GORGEOUS in my bedroom haha. How do you make them? Yummmm! Chocolate Fudge Pie...the picture pops right off the page! Love the artwork and know I will love the pie! Your blog is delightful...glad I found it! Oh, count me in! You have the best giveaways!